Dr. Wolnik's website wins prestigious WebAward. The Web Marketing Association announced the winners of the 2014 WebAwards, a prestigious award in the web design industry. 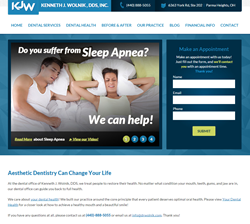 Kenneth J. Wolnik, DDS, a dentist in Ohio, was recognized for his exceptional website design. Dr. Wolnik received an Outstanding Website award in the Professional Services category. Dr. Wolnik’s website was designed by Artonic, a Michigan-based web design and digital marketing agency. Each website submitted to the WebAwards was judged on various criteria including design, innovation, content, technology, interactivity, copywriting, and ease of use. Dr. Wolnik’s website received a near-perfect score in almost every category and performed particularly well in the copywriting, design, content, and interactivity areas. Judges were highly impressed with the Kenneth J. Wolnik, DDS website. They praised the navigation structure and the uniqueness of the site as a whole. Established in 1997 by the Web Marketing Association, the WebAwards were created to set industry standards for the most outstanding websites on the Internet. Kenneth J. Wolnik, DDS is a dentist practicing in Parma Heights, Ohio. For the past ten years, Dr. Wolnik has provided patients with expert, comprehensive dental care. His services include everything from general dentistry to restorative and cosmetic services. To learn more, view the Kenneth J. Wolnik, DDS website at http://www.drwolnik.com.